In the sphere of economics, wealth is defined as the value of assets less liabilities – meaning the value of what one owns and owes respectively. Between mid-2017 and mid-2018, global wealth rose by 4.6 percent, outpacing population growth and reaching a record high – i.e. 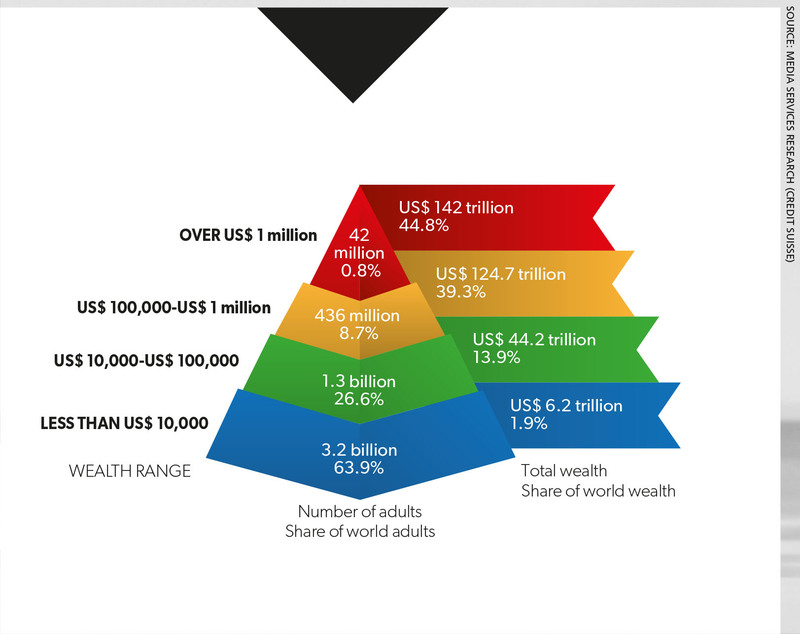 in terms of the mean wealth of the world’s adult population. A RICH IRONY! By 2030 however, the richest one percent on Earth are expected to account for as much as two-thirds of the world’s wealth; and by 2050, the top 0.1 percent could own more wealth than the global middle class! The international Occupy movement, which took root in 2011 along with the Occupy Wall Street protest rallies, helped highlight the unequal distribution of wealth among the rich and poor. And last year, the wealth of the world’s billionaires increased by US$ 900 billion whereas that of the poorest 3.8 billion declined by 11 percent. While the wealth of many countries has increased in recent decades, large chunks of public wealth have been transferred to the private sector, which has undermined public wealth in rich countries. This in turn impacts governments’ ability to invest in the delivery of public services to the population as a whole – including those who are unable to afford private sector services. INCOME TARGETS Economic inequality has been recognised as a global issue, which is demonstrated by the UN General Assembly establishing a reduction of inequality as one of its Sustainable Development Goals (SDGs) – SDG 10 looks to “reduce inequality within and among countries” by implementing policies that address the needs of disadvantaged and marginalised people. One of the targets is to ensure that income growth in the poorest 40 percent of a nation’s population increases at a higher rate than the national average. The UN notes that between 2010 and 2016, the incomes of targeted populations in 60 (of 94) countries grew faster than that of the entire population – an improvement from the 56 (of 94) countries that did so from 2007 to 2012. But the United Nations emphasises that there’s a need to accelerate progress to reduce “growing disparities” within and among countries. GROWING CONCERN Since 1980, income inequality has widened in most countries albeit at different rates. Meanwhile, the share of national income of the top 10 percent of earners in most regions has increased even though the poorest half of the global population have enjoyed higher incomes. But between 1980 and 2016, the latter is estimated to have counted for 12 cents of every dollar in global income growth as opposed to the 27 cents earned by the richest one percent. The World Inequality Lab observes that the global middle class has witnessed slow or even stagnant income growth. So while the world witnessed a hike in overall wealth of US$ 14 trillion to 317 trillion dollars between mid-2017 and mid-2018, a third of this increase was concentrated in North America. Furthermore, the US produced 878,000 new millionaires during this period. During this time, the average wealth of an adult was US$ 63,100 dollars but a few countries and regions recorded a mean income of 100,000 dollars – they included North America, Western Europe, and rich Asia-Pacific and Middle Eastern nations. When it comes to household wealth, North America and Europe account for 60 percent of the world’s wealth. 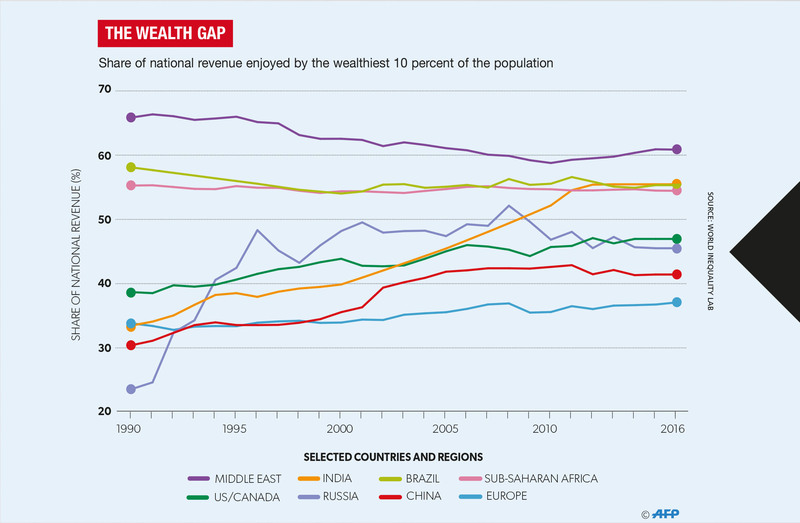 But these wealth gaps do not occur solely in the West. 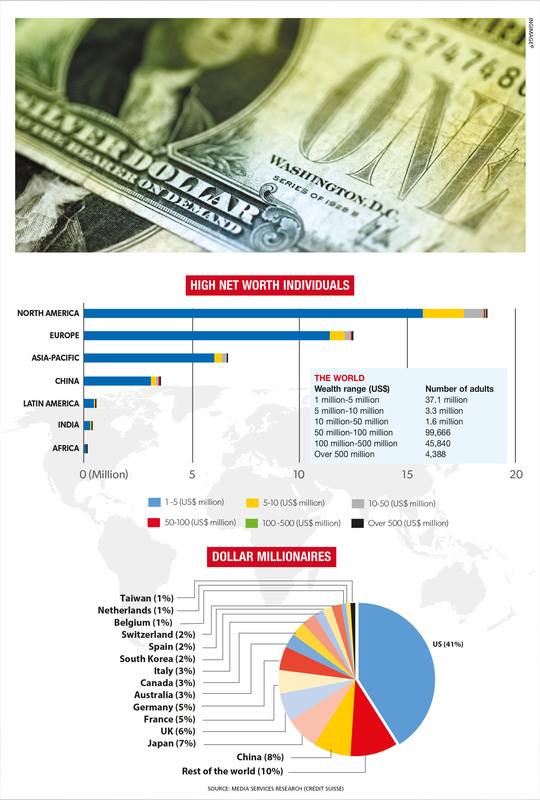 China is considered to be second in the ‘world wealth hierarchy’ with a 4.6 percent increment in riches. However, the disparity in distribution is highlighted by a mean adult wealth of 47,810 dollars and median wealth of US$ 16,333. GENDER DISPARITIES The wealth gap appears to place a heavier burden on women as countries that aren’t economically equal so to speak also tend to have more gender disparities. Globally, men own 50 percent more of the wealth there is than women. Income equality between the genders has also been a subject of discussion in recent years with UN Women reporting that the global gender wage gap stands at 23 percent. Credit Suisse estimates that women account for around 40 percent of global wealth with their share having risen over the course of the 20th century. Their share of wealth in Europe and North America is estimated to range between 40 and 45 percent, while countries in the Asia-Pacific region (excluding China and India) are at the lower end of the spectrum with 25-35 percent. A lack of public services may also directly affect women as the burden of caring for children, the elderly and sick is likely to fall on them, which impacts women’s ability to access education and take advantage of other opportunities. REGIONAL DIVIDE In the local context, there’s a notable divide between the Western Province and the rest of the island with the former accounting for almost 40 percent of the country’s nominal GDP in 2017. While Sri Lanka has made progress in tackling poverty – having achieved the UN Millennium Development Goal (MDG) of halving national poverty seven years ahead of the target date – income inequality remains a challenge. Department of Census and Statistics (DCS) data reveals that in 2016, the richest 20 percent of the population accounted for 50.8 percent of total household incomes – in stark contrast to the 4.8 percent earned by the poorest quintile. When it comes to women, more progress is needed to ensure that wealth is distributed equally – to this end, the female labour force participation rate stood at 34 percent in the third quarter of last year. These shortcomings can be addressed by creating more opportunities for employment, higher education and public services – especially in rural areas where a majority of Sri Lankans are dependent on the agriculture industry. GLOBAL INITIATIVE If these global trends continue, income inequality is expected to rise even though wealth is also projected to increase. 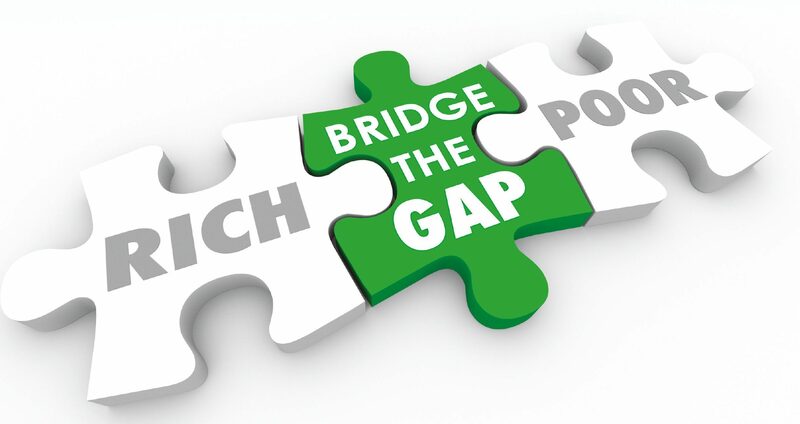 Addressing the ever widening wealth gap calls for government intervention in the form of investing in and ensuring access to education, healthcare and other public services. The modern world is brimming with complexities ranging from climate change to trade wars and political instability – and indeed, conflicts in many regions. In their race to combat these impediments, the majority of global citizens have to contend with income inequality. This in turn impacts just about everyone and is directly linked to the people’s quality of life. Although there’s been little to suggest that there are any foolproof solutions on the horizon, it goes without saying that the need to address wealth inequality is upon us all. This isn’t rocket science. 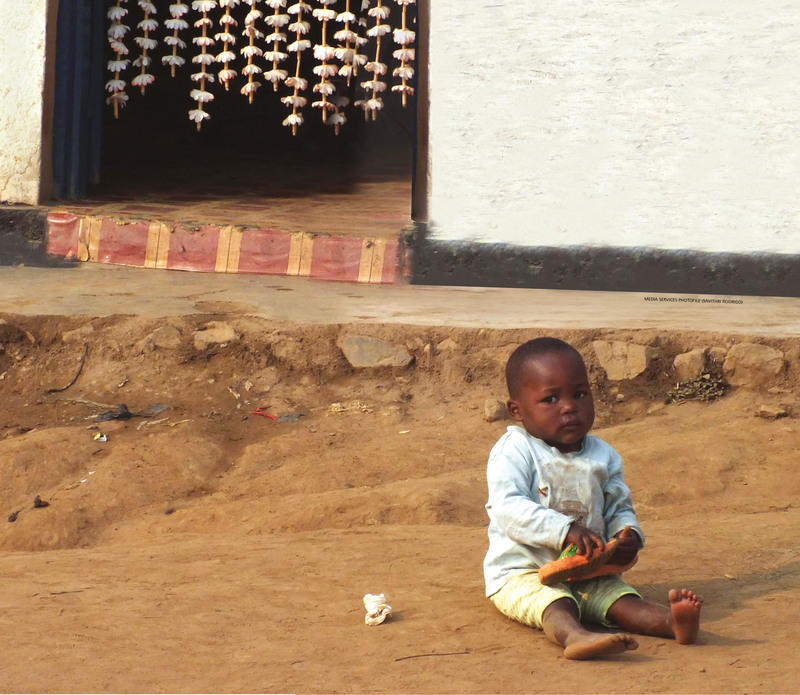 Today, 42 individuals hold the same wealth as the poorest 3.7 billion people on Planet Earth. If this hasn’t captured your attention, let’s try another statistic: currently, over 750 million people continue to remain below the international poverty line whilst at the other end of the spectrum, over US$ 100 billion passes from deceased billionaires to beneficiaries every year. Still not caught your attention…? How about some trivia then…? In general, how long would it take the CEO of a top five global fashion brand to earn what a Bangladeshi garment worker would accumulate in his or her lifetime – meaning, an entire lifetime? Well, the answer is four days! But hold on… Surely, this problem is being addressed? After all, global GDP has grown by over 37 trillion dollars since the turn of the millennium. Even if a fraction of this appreciation of wealth flowed to the bottom of the pyramid, wouldn’t it be sufficient to make a massive dent in, if not completely eradicate, poverty? Most of the new wealth continues to flow to the top of the pyramid with people at the bottom having to fight for the scraps. In 2017 for example, 82 percent of the new wealth created went to the world’s richest one percent whilst astonishingly, nothing flowed to the poorest 50 percent. Unfortunately, the problem doesn’t end there. Not only is the top of the pyramid acquiring a lion’s share of new wealth but it’s also receiving an increasingly higher share of existing riches. A case in point is the global cocoa value chain where Oxfam estimates that eight traders and grinders control 75 percent of global trade. Today, less than six percent of the value of a chocolate bar reaches a cocoa farmer compared to 18 percent in the 1980s. The political and economic framework ingrained in the DNA of most if not all countries is a major contributor to today’s sorry state of affairs. We live in a world where offering a bribe is considered illegal but it’s perfectly acceptable for a large corporation to finance a politician’s campaign, and subsequently receive generous subsidies and tax breaks. Therein lies the problem; the very individuals searching for a solution to inequality are being funded by those who are at least partially responsible for creating the problem in the first place! According to a recent study, corporations that invested money in lobbying and campaign finance outperformed their peers by 5.5 percent over a three year period. So it is not surprising that during the 2016 US presidential election, Donald Trump’s and Hillary Clinton’s campaigns received almost US$ 300 million from super-PACs, which raised money from corporations, individuals and unions. It is difficult to imagine a path to a more equitable world unless we eliminate such conflicts of interest that are rooted deep within the foundations of our current political and economic frameworks. Therefore, steps such as restrictions on political contributions as well as greater transparency related to campaign financing are essential. ROOT CAUSES It is clear that income inequality is a major blip in the otherwise fascinating progress of the human race. What is less apparent is the root cause of this large-scale social problem and why countless governments across the world have failed to address it. It’s not for a lack of trying. Across the world, progressive tax regimes (which place a higher tax burden on individuals with high incomes) are the norm rather than the exception from the private sector driven US to state directed China. In fact, the five most populous countries in the world maintain progressive tax regimes. At the same time, about 2.5 billion people are covered by a social safety net – of which 650 million are in the poorest 20 percent. These policies seem to have been taken directly from the ‘reduce income inequality’ playbook. If so, why have they been ineffective in tackling the problem? To identify a major flaw in the status quo, we need to take a journey across the Indian Ocean to a country with a history as rich and troubled as our own – South Africa. In 2017, an Oxfam report identified South Africa as having the most progressive tax regime in the entire world. In the same year, it was also recognised as having the world’s largest gap in income inequality. How could a country that places such a high tax burden on the rich be placed dead last in income inequality? Unfortunately, the answer isn’t surprising. PROGRESSIVE STEPS Although South Africa ‘theoretically’ maintains a progressive tax regime, the actual taxes paid by the wealthy are nowhere near the rates that are ‘theoretically’ applicable to them. In South Africa, aggressive tax avoidance by those at the top of the pyramid has become the norm with both corporations and wealthy individuals using myriad techniques – such as transfer pricing and tax havens – to minimise their tax liabilities. For example, a recent study estimated that the South African government loses about ZAR 7 billion (approximately US$ 500 million) every year due to profit shifting by multinational corporations (MNCs). The problem of tax avoidance is by no means unique to South Africa. According to the IMF, Americans pay only 68-71 percent of the taxes that the government could theoretically collect. But tax avoidance by American corporates reaches even dizzier heights. LABOUR STANDARDS According to a recent report published by The Investment Integration Project in collaboration with the Principles for Responsible Investment, the erosion of labour standards is another theme that has contributed to the rise of income inequality. Unfortunately, this phenomenon directly correlates with the rise of globalisation as companies increasingly focus on core competencies and outsource non-core activities. This increase in outsourcing and offshoring has diminished corporations’ responsibility for such outsourced workers who often reside in countries with lax labour laws. Which is why recent efforts to regulate CEOs’ pay (e.g. recently introduced regulations in the UK requiring listed companies to publish pay differences between chief executives and staff annually) will be unsuccessful in tackling the broader problem. SKILL PREMIUM Another factor that has led to the rise of inequality is the ‘skill premium.’ The rapid advancement of technology has coincided with an equally rapid decrease in the share of global income accounted for by labour with the IMF estimating that this decline has been underway since the 1980s. In simple terms, capital is replacing labour as technological advancements make it a far more productive resource. This in turn has led to a reduction in demand for unskilled or low skilled workers and a substantial rise in demand (that often outstrips supply) for employees with specialised skills. Unless serious measures are taken to address the skill premium, the problem is bound to snowball out of control. For example, McKinsey & Company recently projected that automation could eliminate up to 73 million jobs in the US by 2030 – and the jobs most at risk were physical work in predictable environments. At the same time, jobs that are safest from the effects of automation involve managing people and require high-level expertise. In layman’s terms, automation threatens the low income security guard of an apartment complex far more than the individual residing in the penthouse. Which leads us to another question: how do we resolve this anomaly? REMEDIAL ACTION We could begin by acknowledging that income inequality cannot be resolved by stopgap measures. In fact, such measures are akin to a captain ordering the crew to repaint a sinking ship. The ship may look new with every fresh coat of paint; but no amount of paint in the world is going to fill the gaping hole in the hull. Similarly, stopgap measures to solve inequality may look great at first glance but will not be able to fill the gaping hole in our story of economic progress. One concrete measure for tackling income inequality can be identified by analysing a somewhat surprising case study – Mexico. According to the World Bank, Mexico has witnessed a major narrowing of income inequality in the past 25 years, which has coincided with a substantial investment in education. Today, Mexico’s gross secondary school enrolment rate is over 95 percent compared to less than 50 percent in 1980. To those who argue that correlation doesn’t equal causality, consider this: a study published by the Brookings Institution in 2015 concluded that if degrees were awarded to only 10 percent of US citizens who do not possess one, it would be sufficient to reduce income inequality by a third. Another case in point that highlights the importance of affordable and accessible education is a sector that’s considered one of the most inclusive – i.e. technology. Despite Silicon Valley’s allure as a land of opportunity, a study conducted by the Ewing Marion Kauffman Foundation found that over 90 percent of US born tech founders held a bachelor’s degree with 31 percent holding master’s degrees. QUALITY EDUCATION Of course, simply investing in education is not the solution; access to ‘quality education’ is imperative to tackling inequality. An approach adopted by Mexico in this regard is the concept of ‘school autonomy.’ It provides public schools adequate funding as well as the autonomy to make independent decisions whilst holding them accountable through the publication of school results. Such schools are often run by committees (comprising parents and other local stakeholders) that make strategic and operational decisions – including decisions to hire and dismiss teachers. Another innovative approach to providing broad based access to quality education is the ‘Escuela Nueva’ concept pioneered in Colombia in the 1970s. This concept focusses on establishing small and no-frills schools. They prioritise cooperative and active learning, compared to memorisation and passive learning. In 2016, Escuela Nueva cost about US$ 30 a student each year compared to Columbia’s average annual spending of approximately 2,000 dollars annually on an elementary school student . Other countries across the world have also adopted the concept and achieved considerable success. For example, Vietnam, which was an early adopter of Escuela Nueva, ranked in the world’s top 10 for science (ahead of the US, Germany and Switzerland) in the 2015 Programme for International Student Assessment (PISA) rankings released by the OECD. An inequality of access leads to an inequality of opportunities. Considering that 65 percent of jobs would require post-secondary education by 2025, it is important that concrete steps are taken to resolve the gaping hole in universal education. CREDIT STRUCTURE Another important initiative to tackling income inequality is enabling access to credit and expanding homeownership. Studies indicate that there is a positive relationship between financial depth (the ratio of private sector credit to GDP) and the change in the income share of the lowest quintile of the population. 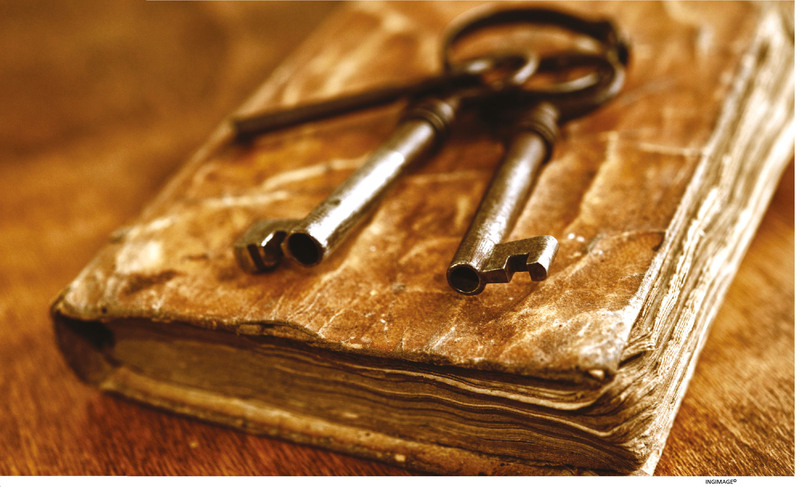 Often, a fixed asset that can be used as collateral is a prerequisite to obtaining credit. Therefore, it is virtually impossible to address income inequality without solving the vexed issue of housing inequality. When 150 million people across the world are homeless, it is difficult to imagine how they would gain access to credit that could enable their financial progress. The impact of landownership on inequality is also highlighted in the previously mentioned case study of South Africa. Today, the non-white population in South Africa own only 27 percent of farm and agricultural land despite accounting for over 90 percent of the population. HOMEOWNERSHIP Although across the world, governments have programmes in place to expand homeownership, there are many loopholes that are exploited by those at the top of the pyramid. One example is the mortgage interest deduction for homeowners that costs the US government around 400 billion dollars each year. According to The Washington Post, the major flaw in this initiative is that it’s a tax deduction, which means that it primarily benefits higher income families. According to Signe-Mary McKernan, a co-director of the Opportunity and Ownership Initiative at the Urban Institute, some two-thirds of federal homeownership and retirement subsidies go to the top 20 percent of taxpayers whilst less than one percent flows to the bottom 20 percent – i.e. low income taxpayers. An alternative to this approach may be a fixed ‘first time home buyer’ tax credit supported by a federal subsidy for first time home buyers in the low income segment. This initiative would encourage first time home buyers rather than helping wealthy families in their quest to buy larger houses. TAX FRAMEWORK Finally, if we’re to make a major dent in income inequality, it is crucial that the top of the pyramid pays its fair share of taxes. At the same time, it would be nonsensical to follow in the footsteps of freshman US congresswoman Alexandria Ocasio-Cortez who recently proposed a 70 percent marginal tax rate for the ultra-rich. 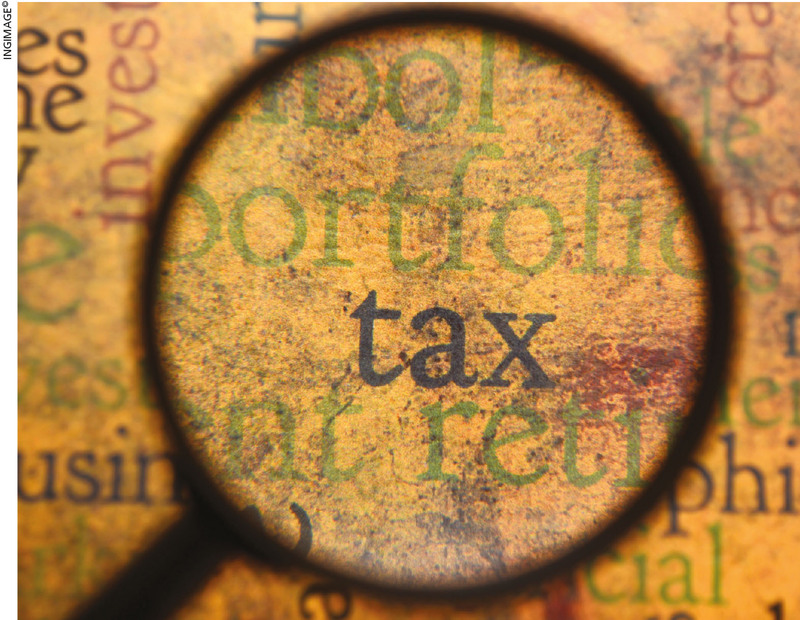 An appropriate balance needs to be struck between ensuring that the wealthy pay their dues, and ensuring that investment and growth are not affected by excessive tax rates. A case in point in the context of the danger of high taxes is France, which currently has the highest tax rates of any OECD country. In 2017, the French government’s tax revenues were equivalent to a staggering 46.2 percent of GDP. Excessive taxation has been a major contributor to the economic stagnation witnessed by France with annual GDP growth not having exceeded three percent in the past 15 years. Raising taxes on the rich is not the only solution to the problem at hand. In fact, it is far more important to address tax loopholes that are regularly exploited by those at the top of the pyramid. SHARED RESPONSIBILITY The OECD estimates that profit shifting by MNCs alone results in revenue losses of between 100 and 240 billion dollars annually for governments across the world. This tax revenue could have been utilised to construct millions of houses for the homeless or provide accessible education under the Escuela Nueva programme to every single child on the planet. Governments across the world need to take a strong and unified stance against tax havens, and ensure that hefty penalties are imposed for tax evasion. In addition, higher estate taxes (that are imposed when money is passed from a deceased individual to a beneficiary) should be imposed on transfers made above certain thresholds to ensure that those born into luxury don’t inherit an unfair benefit over those who are trying to work their way up the ladder. Proponents of higher estate taxes today include some of the richest people on the planet such as Bill and Melinda Gates, and Warren Buffett. Providing affordable and accessible education, expanding homeownership, enabling access to credit and ensuring that the rich pay their fair share of taxes… perhaps none of these measures will be sufficient to address inequality meaningfully. But it is our duty to try. We were fortunate to have won the ‘ovarian lottery’ and it is up to us to ensure that our world is an equitable place for all fellow human beings.